Two plays about the black community, one a revival set in Trinidad in the 1950s, one even earlier, set in the US in the early part of the 20th century. Both have plenty to tell us about the communities from which they’ve sprung and both, coincidentally, about the current state of arts funding in this country. Marco Ramirez’s The Royale springs from Madani Younis’ Bush Theatre. Younis was appointed in 2012 and has set about upping its multicultural profile with huge success, reflected in the continuing support from the Arts Council to the tune of half a million pounds in the present financial year. Younis’s own production of The Royale too couldn’t be more emblematic – a production that zings with confidence, that offers a portrait of a world inhibited by racial prejudice, a black sporting champion rising above it but at cost and with consequences. Inspired and loosely based on the real life story of Jack Johnson, the first Afro-American to win the World Heavweight title, Ramirez’s drama focuses on an imagined character, Jay `The Sport’ Jackson and, like his real life counterpart, his drive to fight a white opponent in order to be recognised as a `World’, not just Afro-American champion. 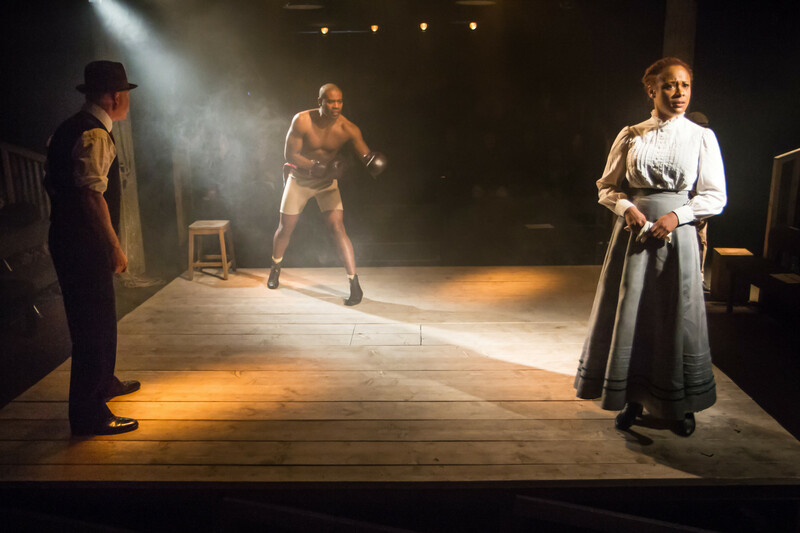 Set within a square boxing ring, the most remarkable thing about The Royale is Younis’s visceral, plangent production. 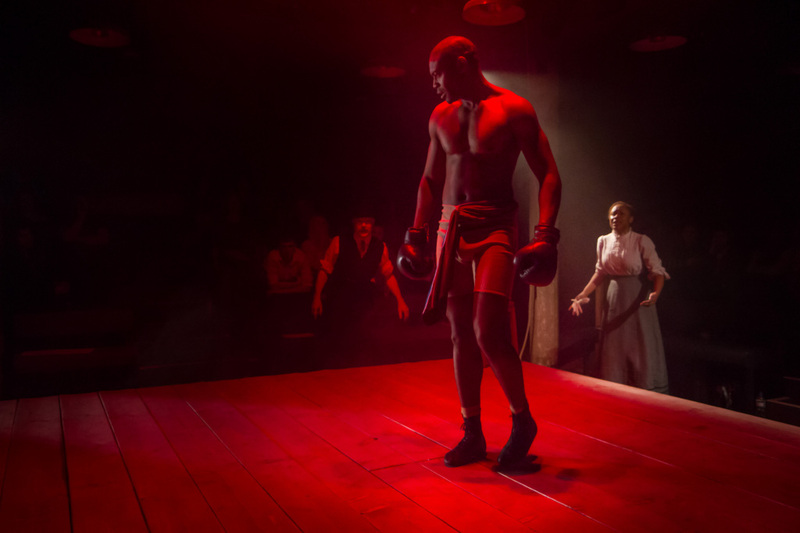 There have been other plays that have touched on boxing and racial themes – Howard Sackler’s The Great White Hope (1967), Roy Williams’ excellent Sucker Punch (2010) – and a boxing metaphor can nearly always be relied upon to create dramatic tension. But I’ve never seen one that transmitted it in such physical and iconic terms – bodies held in shadow or dancing in spotlight, bathed in blue or cerise. Sometimes it’s as if Mohammed Ali has entered the ring, so nearly does Nicholas Pinnock convey that unique combination of boastful, bragging sporting beauty. Beside him Ewan Stewart’s makes Max a canny hard-headed and loyal business manager to Jay whilst Clint Dyer as Jay’s second and Gershwyn Eustache Jnr provide twin oppositional poles of old-timer concern and youthful naivety. But it is in Nina, Jay’s sister, in whom Ramirez creates the most telling and graphic expression of the cost of an Afro-American super-champ challenging the status quo in a society ruled by the Jim Crow segregation laws. As a small boy, Jay remembers seeing his sister burning her hair, trying to make herself look like white girls in local posters. And it is Frances Ashman, body taut with fear and apprehension, who becomes Jay’s ringside voice of conscience and memory in a climax that rises to a knock-out on any number of levels. Absolutely stunning, over in Richmond, artistic director Paul Miller learnt on the first day he took over the helm of the in-the-round Orange Tree theatre from Sam Walters last year that the Arts Council were withdrawing all their funding. Quite why remains a source for speculation. But bravely programming an outstanding first year of classics and new writing (Miller has just won the Off-West-End award for Best Director and has two of this year’s past productions transferring, one to the National Theatre), he has now revived an early play from one of the pillars of British black theatre, Mustapha Matura’s in his fascinating 1977 Play Mas. Shorthand for Play Masquerade, in some senses, Matura has written it as a tribute to Trinidad’s Carnival, an intrinsic part of the island’s cultural life as he remembers it fifty years ago – an explosion of colour and release for pent-up frustrations for a society still under colonial rule. For him, it also represented a piercing metaphor for other masquerades perpetrated on a daily basis in a British colony by its citizens. Nothing highlights this so much as the island’s racial divisions and Play Mas, in Paulette Randall’s vivid, authentic production spells out in no uncertain terms Matura’s acute satirical eye for the hierarchies existing between Trinidad’s Asian and African related communities as presented in the relationship between Ramjohn Gookool, bespoke tailor and small shopkeeper and Seun Shote’s Samuel, his put-upon assistant. Humour is never far away in Play Mas but it is also filled with sharp political insight with Matura pinpointing the shift that overcame Trinidad post-independence. Samuel, sensing the winds of change joins the island’s up-and-coming independence party. It is he who becomes a Minister, post independence, hobnobbing with America’s security chiefs seeing Trinidad as a useful base from which to keep an eye on Cuban and anti-US elements whilst Ramjohn remains a tailor and sometime local informer for Samuel. 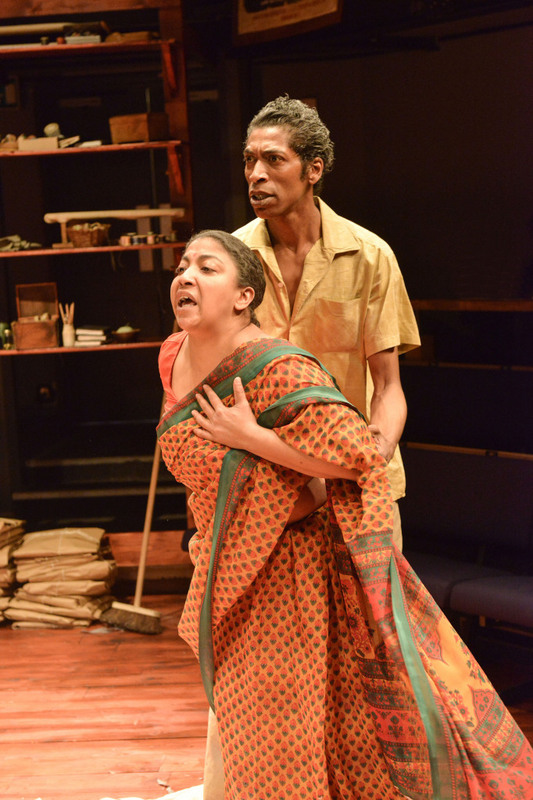 Prescient and informative, Play Mas is a courageous fresh direction for the Orange Tree. One can only hope the funding bodies who hold such power over artists’ futures come to recognise it quickly enough to enable Miller to continue on his exciting new path. 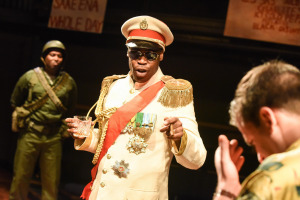 This entry was posted in 2015, Reviews and tagged Bush Theatre, Madani Younis, Off-West End, Orange Tree, Paul Miller on March 22, 2015 by Carole Woddis.